Local Flight East: This isn’t the runway you’re looking for. My first stop, Waterloo, has two runways to pick from (well 4 runways but two strips of asphalt, you get what I mean!) As shown below. 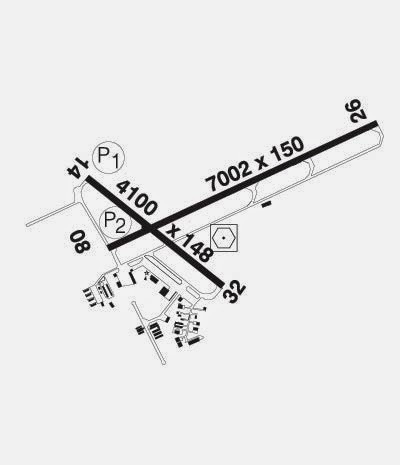 During my preflight planning, I was attempting to draw my funky little diagram of the runway layout as seen from the direction I’d be approaching the airport. Please understand that spatial awareness is one of my biggest issues (apart from the confidence thing). I just don’t form good mental pictures of what is going on around me. This is why I get so concerned about joining the circuit at unfamiliar airports. Visually instructions such as “cleared to the left downwind” don’t mean much to me, I don’t see them in the same way that I know other people can form mental pictures of these things. For me it takes a great deal of thought and some degree of hand waving before I can physically work out where I’m meant to be. Anyways, back to the diagram, I was trying to copy the runway diagram out of the CFS, orientating it in a direction which might prove useful. I couldn’t do it, I just couldn’t picture what the runways would look like from the direction I’d be approaching. Realising he was right I just drew it with North at the top and hoped for the best. Which is how I found myself hopelessly confused when ATC eventually cleared me into the downwind for 08. I mean I’ve spotted the airport and I can see a runway enticingly beckoning me towards it. I know that entering into the downwind involves flying parallel to the runway before making the turn to base and then final. I take a look at the view in front of me again and then glance at my heading indicator. I look back outside again. Bob is staying silent, I suspect he wants to see if I can figure this out by myself. One last glance at my heading indicator. Flat, almost obscured, there is 08/26 stretching out along the skyline, hiding away while it’s brazen, shorter cousin tries to lure me away. “I need to turn 90 degrees and then I’ll be established on the downwind” I cry triumphantly. Out of the corner of me eye I see the thumbs up from Bob. A small triumph maybe but a massive boost in confidence. This time Bob did exactly the right thing in keeping quiet. I needed to know that I can figure these things out for myself, that when push came to shove I didn’t let myself get lured into joining the wrong circuit. I kept my cool and did the right thing.